These sandals by Dollhouse with the ruffle details looked exactly like the ruffled heels that have been so popular this year! They were super cute and come in all sorts of colors and a few prints too. I have to admit I loved them! 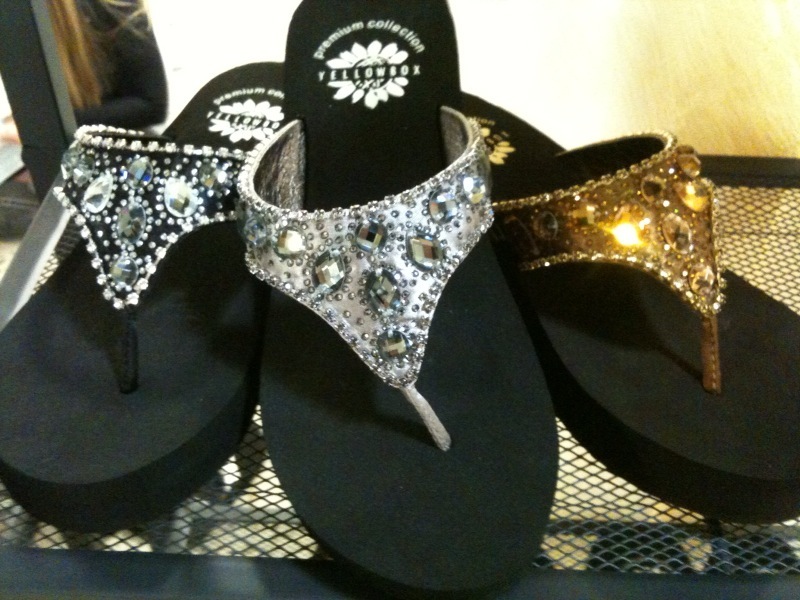 These jewel embellished flip flop sandals by Yellowbox are hot, super comfortable, and trending this summer! As you will see in some of the other photos, the jewels and metallic straps will be all over the place this summer. Again, here we see jewel embellishments and metallic detailing on the straps on these Jessica Simpson sandals. 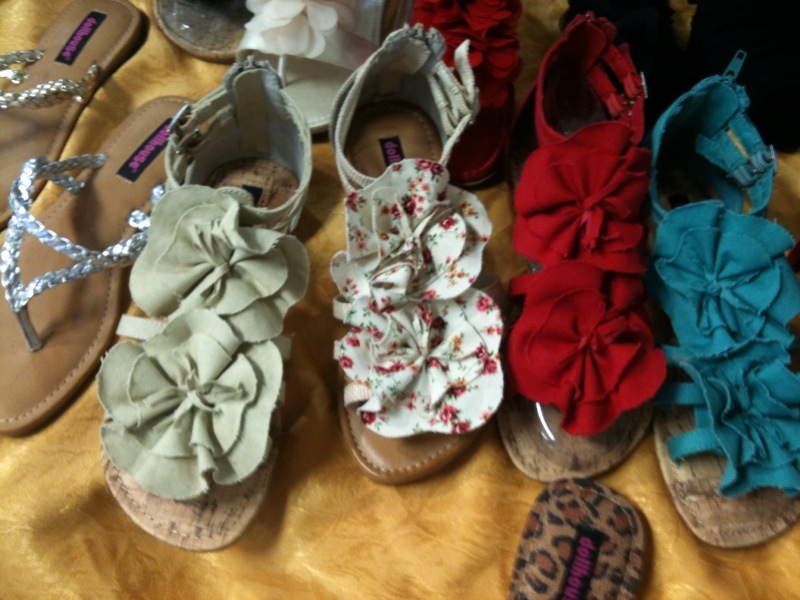 And again on these Jessica Simpson sandals. These sandals by Onex are also showing metallic toned straps (as well as some colorful straps) along with crystal and jewel embelllishments. Believe it or not, these cuffed ankle flat sandals by Wanted, which have been all the craze this past year and will continue to be hot this summer, pictured above are kids’ shoes! Of course, they were shown in women’s sizes too, but I thought that they were so cute in these tiny sizes! These are also kids’ sandals by Wanted, as you can see how small they are next to the slinky, but again the ankle cuffs on flat sandals (and on other flat shoes as well) are trending this year. Shoe Lovers, Don’t Miss The After Christmas Shoe Sales! WhatAmericaIsSearching.com: As we get closer and closer to Christmas, many people have already made their Christmas gift purchases and are thinking about the many after Christmas sales that could save them money. 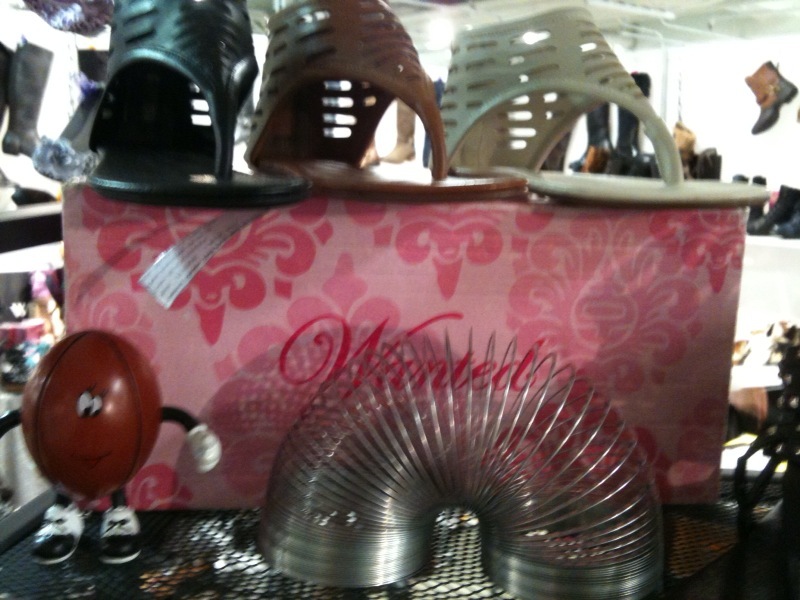 It should come as very little surprise that many are searching for after Christmas shoe sales in 2010. This website has deals on shoes from Aldo, DSW, Zappos on heels and other types of women’s shoes. Worth checking out! YourFeetMakeYouUnique.com featuring Stuart Weitzman ruby red pumps. By the way, Stuart Weitzman is having a 50% off sale!!! Offers.com has great offers on shoes from Steve Madden, ShoeBuy.com, Finish Line, Guess, Shoebaca, and department stores such as Macy’s, Bloomingdale’s, Sears, Lord & Taylor, Kmart, Target, and Kohl’s. Steve Madden 'Chelseey' platform ankle bootie on sale now! Journeys Kidz Sale: Save Up To 50% Off Boys Apparel, Shoes, & Accessories! The shopping guru.com is featuring a 50% sale on Reebok shoes! TheNarrowShoe.com is giving us the heads up on some great shoe sales too! New! Tuesday,12/29 Offer! Stuart Weitzman Footwear- All Styles 80% off Today Only! New! Wednesday,12/30 offer! Donald J Pliner Footwear and Handbags- All Styles 70% Off Today Only! New! Thursday,12/31 Offer! Asics Footwear and Apparel- 60% Off All Styles Today Only! New! <1/1-1/3: Rockport- All Styles 24.95 or less This weekend!